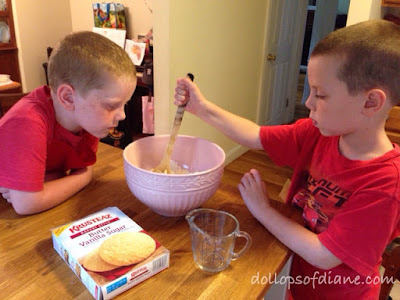 Dollops of Diane: Back to School and a Krusteaz Cookie Giveaway! 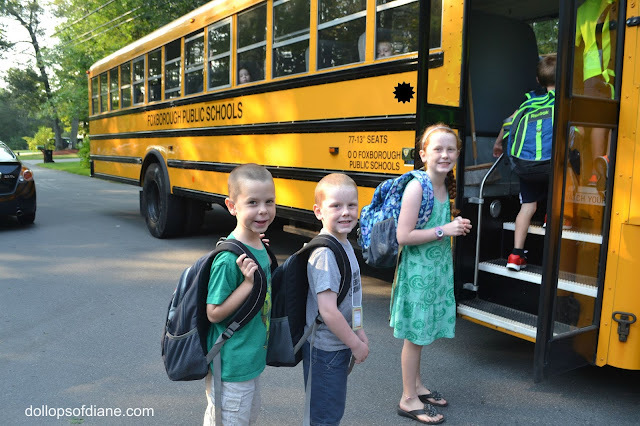 We are now on week three of back to school here at the Dollops household. Summer is (sadly) starting to feel like a distant memory. Here they are off to1st, K, and 2nd! September is not only back to school here but also back to homework and piano and soccer (x3) and Girl Scouts and what feels like a million other things. It often feels like there aren't enough hours in the day to get things done so I was excited when Krusteaz sent me a box of cookie mixes to try out. Now I actually really enjoy making cookies. If I had more time and more will power not to eat the dough, I'd make them more often. With the Krusteaz mixes though I don't need that much time. They're also the perfect amount of work needed for kids to help but not drive you nutty in the process! So far we've tried out the Butter Vanilla Sugar that we enjoyed on movie night and the Double Peanut Butter as an after school snack. Both got two thumbs up from everyone! To find our more about Krusteaz and all the yummy products they offer, click HERE. Krusteaz has been gracious enough to allow for one lucky Dollops reader to get in on the baking fun, too. One winner will receive a Krusteaz prize pack including one of each of the cookie mixes listed above as well as some additional Krusteaz goodies. Enter via the Rafflecopter form below for your chance to win! *Disclaimer: This post was written in partnership with Krusteaz and I received complimentary products. As always, all opinions are my own.